There's more you can do to celebrate the beautiful planet we call home than simply using a reusable water bottle. Here are some ideas on how to celebrate Earth Day 2018 this weekend. WASHINGTON — Earth Day lands on Sunday, April 22, and the focus this year is ending plastic pollution. But there’s more you can do to celebrate the beautiful planet we call home than simply using a reusable water bottle. The D.C. area boasts some pretty exciting events this weekend — some where you can learn about what’s putting our environment at risk, and others where you can actually get your hands dirty! Check out how to spend your Earth Day weekend in the gallery below. Join one of the Earth Day events sponsored by D.C. Mayor Muriel Bowser in the nation’s capital. 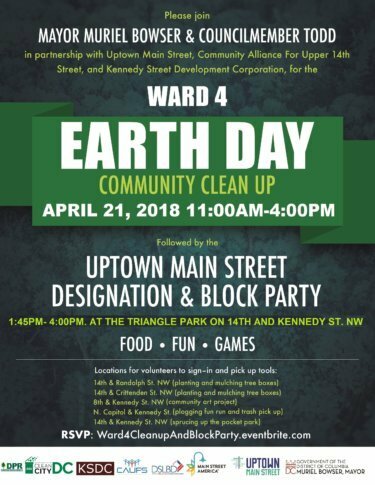 Hosted by Uptown Main Street, the Community Alliance for Upper Fourteenth Street and the Kennedy Street Development Corporation, there’s a series of earth-saving hangs to choose from. A personal favorite? Plogging — the Swedish creation of jogging and picking up trash at the same time, according to the event page. Healthy for you and the planet — a win/win! But that’s not all: There’s also planting and mulching tree boxes, “sprucing” up a community park, a community art project and a block party that Bowser and D.C. Council member Brandon Todd will also be attending. See locations for each below.